We are currently experiencing server issues. 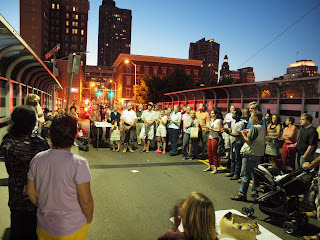 Last Saturday night, we held a block party to celebrate the installation of the first ever solar lights in New Haven. We began just about a year ago, after a rash of crime that was happening in the dark spots just over the bridge on the way to Wooster Square. Ben Berkowitz attended a block watch meeting and introduced us to SCF and we were off. I sent the link to our list of nearly 300 block watch members and through our commenting and posting, we kept the issue of the Court Street Bridge needs lights as number one in the city for weeks. I went to a Mayor's Night In with print outs of the best comments on SCF. Together with other passionate members of our neighborhood, we made our case of the need for lights to Mayor DeStefano. He pledged right there and then to light the Court Street Bridge. From there Chief Administrative Officer, Rob Smuts and Seb Asadourian, the head of lighting for the city attended more than one block watch meeting with proposals for lighting the bridge. Over the next 9 months, they kept us informed on every step of the project that was funded with stimulus money. In August, the lights were installed and now, from my apartment on Court and Olive Street, I can see all the way to State Street at night. Neighbors who work down town have all chimed in to say how grateful they are for the lights on the bridge. Now that the sun is setting earlier and earlier, more and more neighbors will reap the benefits of the Court Street Bridge Lights. What an achievement! What a partnership for Wooster Square Watch, SeeClickFix and the City of New Haven. This is how you make something happen! I traveled to Chicago on Thursday for Block by Block, community news summit in Chicago. Hosted by Jay Rosen and the Reynolds Journalism Institute, the event was a coming together of many independent local news sites from around the country. Along with David Cohn, spot.us, I facilitated a conversation on engagement and participation in local news. The room was packed. We discussed some of our failures and successes in encouraging participation through commenting and posting stories as well as a formula for engagement. As I looked around the conference I realized that I was not really looking at a room full of journalists and editors. The room was really filled with community managers and facilitators. The job of the new media is no longer to create the content but to facilitate and nurture the content and the community that engages with their media property. What amazed me more is that this room full of hundreds of once journos and editors are truly self aware of their new roles. Because SeeClickFix can not attend a news conference without publicly noting the role of media as the 4th estate and their new tools for implementing that authority I challenged the group to help make Chicago more open. SeeClickFix is looking for community groups and news orgs to embed our widget and encourage alerting to City Hall. I decided to stay in Chicago to participate in a second community workshop conference where one of the subjects is Gov20. I always find the synergies between participating in government and participating in media interesting as SeeClickFix allows citizens to do both with one action. There are many times where I wish that the two industries would collide and work together to encourage greater participation. For now I have to go to multiple conferences. I'm really excited to be on this panel as it includes our partners and friends from Every Block and IBM who are both encouraging open municipal data and facilitating its implementation at the national level. As well Justin Massa, Metro Chicago Info Center, and Jake Trussell, World Business Chicago, will be representing the local interests of open government and hopefully be able to facilitate the learnings locally post conference. SeeClickFix's goal for City Hall in Chicago is two-fold. 2) Enable Open311 so that sites like SeeClickFix can connect directly into their business processes for managing citizen requests. How do we do this? Prove to Chicago that citizens want to communicate in an open fashion. Will it work in Chicago? We think so it seems to have everywhere else. This Saturday evening Wooster Square neighborhood in New Haven celebrated the city's first solar street lights. On the Court Street bridge neighbors showed up to thank the city, SeeClickFix and President Obama for the added sense of security provided to the gateway of their neighborhood. From complaining to resolution this is the story of how a neighborhood dramtically improved public safety in the past 1 1/2 years. Wooster Square started documenting pedestrian concerns on SeeClickFix two years ago. Collectively lobbying for pedestrian in road signage they learned to work together to encourage the city to improve pedestrian safety. Soon the economy started to dive and street crime such as muggings in the neighborhood started to pick-up. The bridge hosting this celebration was the most frequent location of the muggings and also the access point to the neighborhood. Neighbors met on SeeClickFix around the same concerns and started a neighborhood group to address the concerns. They then used SeeClickFix to lobby the private apartment buildings for lighting as well as temporary lighting from the City. The final resolution came when the neighborhood group led by Kari Brady printed out the SeeClickFix issues and petition and walked them into City Hall. A promise to place solar lights on the bridge was realized and the rest is history. There has not been a mugging in the area in over 9 months and the permanent solar lights are now placed on the bridge. Here's to stronger communities stymied by citizens that were willing to speak-up and unite for their own safety. Here's to a web platform that can enable that engagement and that participation in a meaningful way. Here's to a city that has learned to respond to the needs of its citizens and enable their participation in defining the public space. In a conversation on engagement and building community in local news at Block by Block we started to hash out a formula for engagement in local news. I had never really thought about abstracting the principles of SeeClickFix that make it a functional platform but it seems that they apply to Spot.us as well as local news organizations that successfully drive participation. I actually saw Ben at some community meetings we attended in the past and even got his business card in more than one location. Unfortunately in those meetings you don’t have the chance, when things are political, to get to know each other. That radio interview was the fist time for me to get to know Ben, because it gave me the opportunity to know how he understands the community’s problems and what is more valuable. He expressed how problems affect the quality of life of the human being in the community. I believe that the quality of life will rise up the value of the whole town. That night, after my meditating session of paying bills, I started using SeeClickFix for the first time. My issue; Graffiti, let me say it again, Graffiti! I don’t care how small the issue is; it is not “OK” to aggravate other people’s properties. For 7 years, after buying my house, the graffiti drove me crazy every single time I passed the corner. Before SeeClickFix, I raised the issue in the proper areas to complain, and asked for the graffiti to please be removed. I got the response, ”Ha, that one, it’s being there for years!!!! !” Three weeks later after I posted the issue on SeeClickFix, the graffiti was GONE! With this experience and a few more issues that got successfully addressed, I started telling my neighbors about this NEW SeeClickFix. We started using it as a “block watch tool” to address some of the concerns we have around the neighborhood. Another example concerns a problem with a pipe that flooded all corners of my neighbor’s house that was giving him “HELL” for 12 years. The issue had previously been addressed to the City. Someone was sent to do the same “quickly” procedure that they’ve been doing for years. After being fed up, my neighbor’s wife posted the issue on SeeClickFix along with some photos to show how bad the issue was. It was affecting their childcare business and home. Two months later, the issue was FIXED! We decided to post these testimonials on Ben’s blog because we believe that when someone does a job well done, we need to let them know that their job and efforts are helping improve families, not just individuals. Ben personally stopped by my neighborhood a week ago to meet the people that are working very hard to keep up with our area. Our community does this so beautifully by planting trees and challenging the dance of “clean don’t trash”. He also met another great guy, Stephen Cremin-endes, from the Neighborhood Housing Services of New Haven. I think he saw the diversity of culture, countries, and especially the support we have with each other. We took a tour and walked around the neighborhood where we were able to express our frustrations with one corner’s business that was not maintaining all the surroundings of the property. One week later the business owner had done a very good job with his property by cleaning and moving old stuff he had all over. This is a big impact on so many levels; we feel respected that he created a clean property. He contributed with our mission to improve the quality of life for our families. Because we are a good percent of homeowners in this little area of Fair Haven, he also offered an open invitation to make business with him. Seeclickfix should feel proud of their job, and the business owner will see how much he meant to us with his positive response. We hope you all feel the rewarding feeling of helping the families of Fair Haven. Thank you Ben and all those at SeeClickFIx who made this possible! Eight days ago, using the SeeClickFix mobile application, a SeeClickFixer posted issue #56501"tomlinson bridge fish ramp", to complain about bags of fish heads that were left out on the fish ramp. NewHavenIndependent.org decided to take the lead from the issue reported and decided to further investigate the fishy situation. Starting with a simple post on SeeClickFix, the issue was then given its attention to Livable City Initiative, where their Acting Executive Director acknowledged the issue and will "consult with the other departments about longer-term solutions." The issue was also brought to Kevin Nursick of the State Department of Transportation, who explained that like other government agencies, they too have a budget and must prioritize their responsibilities. A possible solution to this issue was suggested by several, in response to the article posted by New Haven Independent. One user suggests to "put up a sign that says that they will be fined if they leave garbage. and or no fishing will allowed if it continues." The WECT News website has recently integrated the SeeClickFix map widget onto their site. The community in Wilmington of North Carolina have been civically engaged by providing helpful pictures and videos with their issues. Numerous stories following up on issues reported in Wilmington have been reported on the WECT News website updating the public on their status and possible solutions. Manor Texas and GovFresh are kicking off their conference this AM in Manor. Yup, you heard it. We've been screaming from the rooftops that its easy to open up your government to more participation and more engagement. Now its our time to prove it. This little Texas town is going to be equipped with mobile apps and web interface from SeeClickFix as well as other bells and whistles for a functioning Citizen Driven government from Spigit, Firmstep, Socrata, GovFresh, DotGov and Tropo. If you are out in Manor for the event look out for Kam. He's @SeeKayel on twitter. In true Manor spirit someone should take Kam out and encourage him to get a QR code tatooed on his rear. #manorgf is the hashtag for the event. 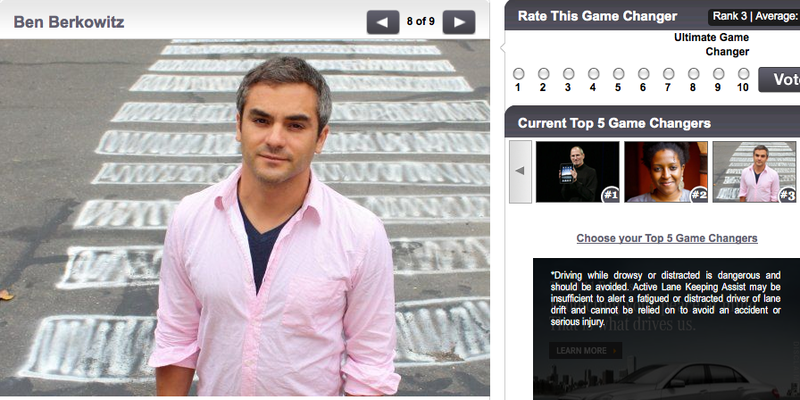 Yesterday we were excited to learn that Ben was named one of 8 "Game Changers for 2010" by the Huffington Post. Ariana Huffington describes the competition as a way to highlight those that are changing the way we look at the world around us. We were totally blown away to be included in this list which includes Steve Jobs and our friends at Ushahidi and Foursquare. 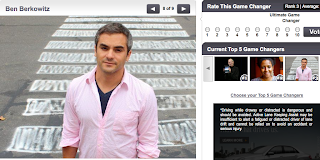 The Huffington Post will pick one Ultimate Game Changer determined by your votes. We were not going to lobby for votes but we are sitting on the edge of the two and three seat right now with Steve Jobs in the lead and we see that there might be a chance of grabbing this thing. I'm headed up to #bif-6 on the Amtrak to share the SeeClickFix story with business leaders from around the world convening in Providence for a two day event of story-telling and sharing. As always I'm struck by the ocean vistas seen from the train in North East corridor...I just wish I could have been allowed to bring my bicycle along with me. I'm looking at you Amtrak and also you average citizen who wants to vote to support my SeeClickFix issue with Amtrak's bike policy. But back to the mission at hand...I'm here because my good friend Matt Mason recommended me for the event. Matt spoke at BIF last year and says it has had a great impact on his career as a speaker. If you've never heard Matt speak before I suggest buying him a beer and preparing for painful laughter. I'd also keep an eye out for his pirate tales performed live in a city near you. So what's BIF and who's speaking? From their website, "The Business Innovation Factory brings partners together to collaborate across traditional boundaries on experiments that deliver transformative, systems-level innovation and address the most pressing problems of our time." For me this will be a place where I will get to share the SeeClickFix story on stage alongside people I hold great respect for such as author Don Tapscott of Wikinomics fame and Start-Up legend Tony Hsieh of Zappos. I will also get to reconvene with some old friends that have come-up in the start-up space alongside SeeClickFix such as Jacob Colker, of beextra.org. Jacob and I first met in Miami 2009 when we competed for and both won the WeMedia Pitch-it Competition. Since then we have looked to each other for advice as well as friendship in the sometimes chaotic start-up environment. At Bif6 I will share the founding story of SeeClickFix and how the timing of our business has been positioned well within the rise of an open government movement, a hyper-local news movement and increasing desire by citizens to participate in their communities in a more actionable and meaningful way. Hopefully Providence is ready for New Haven...I'm tempted to wear my favorite t-shirt on stage. On this beautiful sunny day in Washington, DC at J-Lab in the Newseum, SeeClickFix is excited and honored to be a 2010 Knight-Batten Notable Entry for our News Web Widget. The Knight-Batten Awards recognize news and information efforts that create opportunities to involve citizens in public issues and supply opportunities for participation. Follow @seeclickfix for updates during the event! In less than three weeks New Delhi, India’s Capital is going to host the Common Wealth Games. The games have been highly contentious up till now . The Urban Vision & MSN India have just launched “ I heart CWG Delhi” campaign in an attempt to energize the citizens to rise up for their city & back the Games. For centuries, Indians have been able to make most out of chaotic situations. There is always a work around. Every problem can be solved & fixed. It’s called The Great Indian Jugaad. The People of India managed to become one the most powerful economies in the world with this attitude. So , this campaign pushes the civil society get up and get working to make the experience of the upcoming CWG special for all the guests who are going to visit us this October. The campaign also invites people to use “Citizen Watch” which is powered by See Click fix to report issues and come together and help make our city better. The campaign also encourages Delhites to get in touch with their local Resident Welfare Associations and work with them to get smaller issues fixed. Spread the CWG Delhi 2010 Love. Join the movement! Don't Miss Another awesome neighborhood moment. Get an email when we post next on the blog! Copyright 2010-2013 SeeClickFix. All rights reserved.